If you are a supporter of the Comprehensive Economic and Trade Agreement, the latest development will no doubt be infuriating. It ain’t over ’til it’s over. That includes if some countries have already ratified the agreement it seems. If you follow the agreement as closely as we have, you’ll know that CETA has numerous provisions that would crack down on various rights including digital rights. Our analysis in 2015 found a host of such provisions. These provisions include a global DMCA, implementation of censorship, introduction of a three strikes law, the seizure of cell phones at the border for the purpose of enforcing copyright laws, and introduce unlimited damages for copyright infringement. In short, it’s a sort of laundry list that caused more problems then solve, but ideas pushed by major copyright multinational corporations. Interestingly enough, when Canada pushed for ratification, the inclusion of many of those provisions were never added. Last month, we noted that the Canadian senate passed the agreement. While this may sound like a near miss for the country, Canada isn’t out of the woods yet. CETA also contains what is known as ISDS (Inter-State Dispute Settlement) provisions. This allows corporations to sue countries for loss of profits or future potential profits if regulations don’t favour them sufficiently. In theory, major record labels can still sue Canada for, say, not implementing a three strikes law. These provisions are part of the implementation laws in Canada. While this makes it seem like CETA is a done deal, we’ve already noted last week that Europeans are still fighting the agreement. It seems people on the other side of the pond are still trying to defend their rights and sovereignty. Plans to bring most of Canada’s new trade deal with the European Union into effect by July 1 may be unravelling due to a new dispute over who gets to import EU cheese. Under the terms of the Comprehensive Economic and Trade Agreement (CETA), Canada has agreed to allow nearly 18,000 additional tonnes of European cheese to be imported tariff free. But CBC News has learned that when Canadian officials briefed their European counterparts on how they would allocate the quota for importing this new cheese, not everyone around Europe’s cabinet table felt Canada’s approach lived up to the spirit of the negotiations. 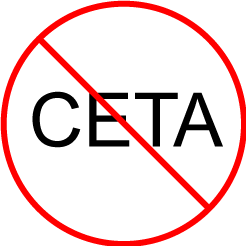 Canadians haven’t been transparent enough about several aspects of CETA’s implementation, the source said, and presented the cheese quota decision as a non-negotiable fait accompli. It was a final straw for upset Europeans who had been otherwise eager to get on with the deal. This is the interesting thing about agreements like this. It affects so many sectors in the economy in so many countries. It is certainly possible that a sector completely unrelated to areas of interest to us can cause a complete collapse in the agreement. In this case, European cheese makers could inadvertently protect digital freedoms online because of cheese quota’s coming from Canada. Try wrapping your mind around that sentence the first time around. It sounds completely ridiculous, but it isn’t an inaccurate assessment of the situation we are seeing right now. Of course, when something is so complex, it opens the door to situations like this. If anything at all, this shows that the fight against the agreement is far from over. It is entirely possible that disputes will continue to flare up over the agreement. In fact, at this point, it’s entirely possible that disputes will flare up even if the agreement is fully ratified in Europe and comes into force. So, stay tuned because even though we are this late in the game here, we are far from the end of this saga.